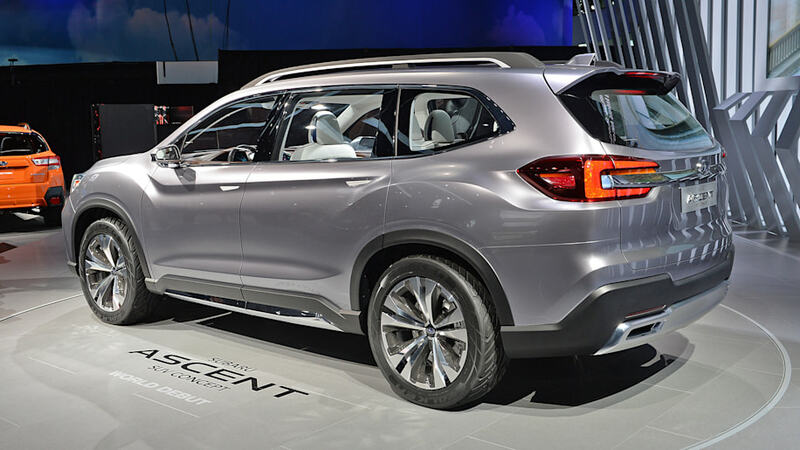 The automaker revealed its new Subaru Ascent 2019 at the LA Auto Show. The all-new sports car is the largest Subaru out there. The new Ascent replaces the Subaru Tribeca which ended production three years ago. Subaru will develop the new 2019 Subaru Ascent in Lafayette, Ind., Subaru’s plant. Hence, the vehicle will be on the market starting with next summer. Subaru is famous for its Forester and Outback SUVs. However, now, the automaker wants to challenge Honda, Toyota and many other automakers which develop large SUVs. The new car will feature three rows of seats for eight passengers. The wheelbase is 113.8 inches. Subaru has designed their new SUV for big families who are always looking for adventures. The Subaru Ascent vehicle is powered by an all-new 260-horsepower, 2.4-liter turbocharged engine. The powertrain enforces a towing capacity of 5,000 pounds. The interior of the car features the Starlink multimedia system, revealing a high-resolution touch-screen display and in-car Wi-Fi. Furthermore, it also features 8 USB charging ports. The car sports four trim levels, varying from the base level to the top-of-the-line Touring model that has leather seats, chrome door handles and a panoramic moonroof. The safety features include automatic pre-collision braking, pre-collision throttle management, sway warnings and lane-departure. Furthermore, it also sports a new EyeSight Assist Monitor which features a display of system warnings on the windshield. The new Subaru Ascent is to compete with numerous other SUVs such as Ford Explorer, Honda Pilot, and Toyota Highlander. Hence, Subaru indicates that its new SUV will be “competitively priced” with its rivals. The new Subaru Ascent combines amazing performance with an extraordinary design. You will be able to take your whole family with you on a trip, having the comfort and the safety you need. Furthermore, the new car will be the largest Subaru ever.